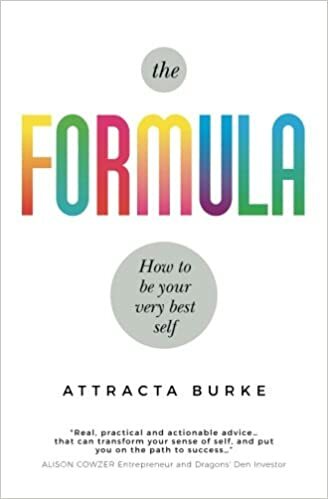 Attracta Burke, author and coach, provides insight into writing a book, and how the advice in her book, The Formula – How to be your very best self, connected to steps of her own writing process. Cecilia: Was there a specific event that acted as a catalyst for your decision to write The Formula? Attracta: After years of running my own businesses, I made some changes to my life and began a career in executive coaching & business mentoring. When I ran my companies – retail pharmacies plus online and wholesale health & beauty companies, I never had any spare time at all. Writing a book was not part of my agenda. The real catalyst for me was when I trained as an executive coach and started to work as a coach and mentor. I realized that whether someone is running their own business, working for a large corporation or at a cross-roads in life, there are some very straightforward tools that can help with living a successful life, with less stress. I wanted to share my version of these tools with as many people as possible. They helped me so much and continue to be useful every day, I felt I had something worth sharing. I decided to find time to write The Formula – How to be your very best self, to get those tools out there in a straightforward, useable format. Cecilia: Why did you decide to begin each chapter with a quote? What did you hope these quotes would convey to your readers? Attracta: I love quotes – funny quotes, smart quotes, thought-provoking quotes. I love the way, one short sentence, if you read it or hear it at the right time can often spark a completely different train of thought. I find quotes help to remind me of what’s important in life. Quotes can spur me into action when I’m having a day where my focus is not quite as good as it needs to be. For example, ‘The smallest of actions is always better than the noblest of intentions’, a quote from Robin Sharma, author and leadership speaker, is one I have printed on the wall above my desk. Every time I read it, I take some small action – whether I want to or not! I used quotes at the beginning of each chapter in the hope that others feel the same. Cecilia: At the beginning of The Formula, you described your experience climbing Mt. Kilimanjaro. You explained that you had “achieved a very clear goal within a defined timeline.” Did you pull from experiences like these to aid you in your writing process? Did you create timelines to manage your work? Attracta: Climbing Mt. Kilimanjaro, as well as being one of the best experiences of my life, also taught me so much. As I reminisced afterwards, I realized that having a clearly defined goal, like getting to the top of the mountain (it either happened or it didn’t), helped my friends and I formulate a plan of action from our training beforehand to route planning to what to do if someone became ill. In business, I have always found that having a clear goal makes planning easier, thus increasing your chances of success. In writing this book, I had a defined timeline where I set myself the task of writing a certain number of words each day. I was also lucky enough to come across Lisa Tener, who, although too busy at the time to work with me as editor, kindly recommended Kelly Malone who was happy to work to an agreed timeline. Cecilia: What did an average day look like for you when writing The Formula? Attracta: As I now know how I work to my best, I exercised each morning before sitting down to write. I often woke early before my husband and daughter, went for a walk or run, an early yoga class, prepared breakfast, walked my daughter to school, then came home and wrote for two to three hours. Some days I had client meetings in the middle of the day, other times, I took a break and got straight back to writing for two to three more hours. There were of course, some days when I just couldn’t focus – not too many of these thankfully. When this happened, I often went for a 20 minute walk, met a friend for a quick coffee or watched an episode of Grace and Frankie on the TV. I laughed during every episode and even though I was often tempted to watch a second episode, when I was writing the book I restricted myself to one episode at a time. Cecilia: In The Formula, you explained that connection, clarity, and confidence are vitally important, particularly when making business decisions. Could these words apply to the book writing process as well? Attracta: I think that having connection, clarity and confidence is vital for being at our best in all areas of life. Having close connections to others has been proven to increase happiness and longevity. Actually, connecting to an idea, really knowing that something is right for you, then ‘going for it’ is such a great feeling too. Having clarity about what matters to you, taking time to think about this, can help you make the right decisions in business and in life. Being clear about what you want can reduce over-analyzing, too, and leave you ready to take action rather than procrastinating. I refer to confidence as the belief that you can do something when you try. Without confidence, everything is just more stressful. Connection to your idea, a clear plan, plus the confidence that you can do it are all absolutely essential when writing a book. Everyone deserves to feel confident and to be able to live life believing in themselves – living with more ease. Cecilia: After going through the book writing process, is there anything you pulled from your experience that you would want to add to The Formula? Attracta: Now I realize the book writing process is just part of the whole process. Publishing, sales, creating and maintaining awareness are equally as demanding and require focus, persistence & resilience. I have created clear goals for these tasks too and have found that useful. Mostly, I would suggest that finding help from people who are experienced within the industry is the best thing to do to maximize your book’s potential. Cecilia: Was there a research component behind your book? Can you explain that process? How did you work to smoothly blend pieces of research with your personal anecdotes? Attracta: Yes, indeed, there was a research component. I had previously carried out a survey on Female Leadership Confidence from which I referenced some data in the book. It was interesting to find from this research that most people found the approval of others helped their confidence, with a smaller number also realizing that it’s important to be able to find confidence within oneself. I commissioned some extra research on confidence, mentoring and habits, all of which was useful to add to my own experiences which I shared in the book. I guess, throughout my career in various businesses, I have quite a few stories to tell. When I read the research, many of my stories made sense and blended nicely with research findings. Cecilia: In The Formula, you discussed that it can be helpful to create a “happiness formula” to refer to when you are having a difficult day. Did you have any happiness formulas that helped you throughout your writing process? Attracta: I find that when you know your own best way of working, how you focus best, maintain your energy and are at your happiest, using a small number of formulas helps keep you on track. For instance, most days I know what actions I need to take to feel good and do my best work. This includes exercise, healthy meals, working through my to-do list and, also, a little bit of chocolate. On a difficult day, my formula may also include a chat with a friend and possibly even more chocolate! Everyone has a different formula for productivity and success. The key is to be clear about what matters to you, to create your own daily formula, and to have the confidence to take action on it. Cecilia: Your writing seems very personal, as if you are having a conversation with someone. Why did you choose to write The Formula in the format and tone that you did? Attracta: OK, I’ll be perfectly honest here. When I started writing The Formula, I had absolutely no idea what the final book would be like. I wanted to share the tools I have found useful in a very straightforward format. There are actually some personal experiences in the book that when I started writing, I had absolutely no intention of sharing. However, as the book came to life, I felt these (sometimes embarrassing) stories were useful to illustrate a point, such as that it’s OK to make mistakes, or that we’re not alone in lacking confidence and that small actions can often produce the big changes we need and want in life. Cecilia: What has the response been like to The Formula? Attracta: I was so nervous when people began to read The Formula. It felt like I was baring my soul. So when people gave me positive feedback, I was absolutely delighted. Response has been amazing – The Formula reached #1 on Amazon, #1 in Dubray Books Ireland and was also included in The Irish Times Top 10 which was really fantastic. I am now receiving regular emails from people about how the book has helped them make decisions, be happier about choices they have made, helped them with work life balance. Only this week, a CEO of a large corpration told me that every business person should read it! It is such a lovely feeling when someone sends a message to say the book has helped them. I feel very lucky to have had the experiences and the opportunity to write this book. Also, writing The Formula has really helped my coaching & mentoring business. I am currently creating a masterclass based on The Formula which I will deliver to companies in-house and also externally. I would recommend that if writing a book is something you want to do – then, absolutely, make a plan and do it. Attracta Burke is a high performance coach, pharmacist, entrepreneur and author and has coached leaders and teams in the Pharmaceutical, Health, Financial, Tech, Not for Profit and Food sectors. Visit her website, The Smart Formula, where you can also receive her free ebook: The Smart Formula: 3 Minute Goal Setting Template. Readers, what questions do you have about writing a book? Share them here. And if you enjoyed this interview, you may enjoy this author interview on Yoga, Mindfulness and Writing a Book with Cara Bradley, as well as Lisa Tener’s article on How to Write a Book.